A company owned by Prime Minister Viktor Orbán’s father was awarded a USD 1.2 million state contract despite Orbán’s claim that his family stays away from state tenders, investigative journalism group Direkt36 reports. This is what Viktor Orbán told Direkt36 at a press conference in Brussels in June 2017, after having been confronted with the fact that his family receives public money from state projects. The PM’s answers suggested that he thought – as opposed to his statements from years ago – it is not a problem for family-owned companies to participate in public constructions as suppliers of building materials. However, after a four-month trial, Direkt36 managed to acquire documents proving that one company of the Orbán family did participate as a subcontractor in a huge railway reconstruction project on the southern side of Lake Balaton. Usually, when it comes to state projects, public information is only published about the main contractor and subcontractors, but not the suppliers. 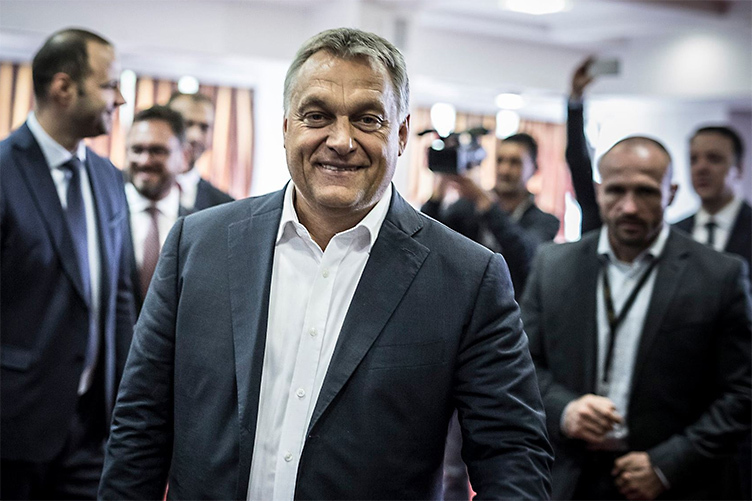 For long, the companies of the Orbán family participated in state projects at a lower level as suppliers, which is why their involvement could remain hidden. Now documents of the Lake Balaton railway project reveal that at least in one case, the Orbán family received public money also as a subcontractor. The renovation of the 53-kilometer railway line near Lake Balaton started in 2016. The final budget for the investment is HUF 72.4 billion (USD 292.5 million), HUF 16.9 billion (USD 68.2 million) higher than originally estimated. 79 percent of the project is financed from EU funds. According to the documents obtained from the main developer of the project, the state-owned National Infrastructure Development Company (NIF), the main contractors engaged a total of 134 subcontractors, including Nehéz Kő Ltd, one of several companies owned by the Orbán family. Nehéz Kő Ltd. receives nearly HUF 300 million (USD 1.2 million) from the project, which also employs Mészáros and Mészáros Ltd. as a subcontractor. The company was founded in 2004 and for years was co-owned by the PM’s father Győző and two younger brothers. Since October 2017, the company is solely owned by Győző Orbán. According to the company’s website, it purchased a fleet of trucks in 2012, which allows it to transport the building materials of Dolomit Ltd, a mining company majority owned by the PM’s father. The documents sent by NIF do not detail what services the company provided the project, and neither NIF, nor the main contractors, nor Nehéz Kő answered Direkt36’s request for more details about the company’s involvement. Apart from Nehéz Kő Ltd, 14 other freight companies participated in the project as subcontractors, but none were paid more than the Orbán-owned company.